Posted on 7, March 2016 by EuropaWire PR Editors | This entry was posted in Germany, Marketing, Technology, Telecom and tagged "Digitization. Simply. Make it happen. ", CeBIT, Deutsche Telekom, digital. Bookmark the permalink. BONN, 07-Mar-2016 — /EuropaWire/ — A giant magenta blossom announces the arrival of the digital spring: with its motto “Digitization. Simply. Make it happen.”, Deutsche Telekom is presenting itself at CeBIT as an innovative, reliable partner for digitization. From March 14-18 in Hanover, Europe’s leading telecommunications provider will present a number of solutions that support SMEs and large companies on their way to new business models in the digital world. In addition to services from the cloud, highlights will include M2M and security solutions, convergent products from the fixed-line and mobile networks and solutions for virtual collaboration and IT platforms. 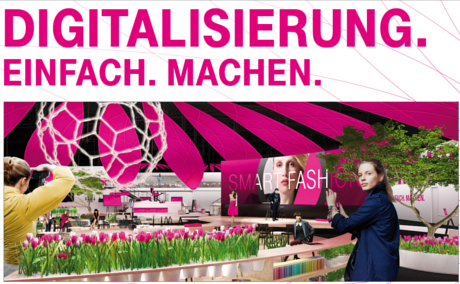 Deutsche Telekom’s brand presence will pose a stark contrast to the many rank-and-file stands at the trade fair: visitors to hall 4 will be amazed by the huge magenta blossom suspended from the ceiling. Eighteen “flower petals” with a diameter of 35 meters form a kinetic installation, spanning the central stage, the TRANSFORUM: in high-caliber talks, top decision-makers like Rüdiger Grube from Deutsche Bahn AG and Oliver Bäte from Allianz SE, together with board members and managing directors at Deutsche Telekom, will discuss experiences, trends and specific solutions for digitization. Each day’s talks will focus on a different topic area, such as cloud computing, connectivity, the digitization of business and security. In addition to this new talk format, Deutsche Telekom will also present reference customers who have already implemented successful digital products, along with a digital lifestyle show combining high-tech, performance and fashion. With models, dancers, lights, sounds and impressive images, trade fair visitors will experience an exciting journey – from smart watch and E-scooter to videoconference robots and the exciting fashion-tech visions of young designers. “Spanning more than 5,000 square meters, our CeBIT stand will make digital transformation tangible for our visitors. With the TRANSFORUM, we will sharpen our focus as a dialog partner and catalyst. And our accompanying program, ‘The Bloom of Digital Life’, rounds out our brand presence in a highly entertaining manner,” explains Antje Hundhausen, Vice President 3D Brand Experience. “Digitization. Simply. Make it happen.” has a twofold meaning: it is both an appeal to face the challenges of the future and our promise to help our customers’ road to new business models in the digital world of tomorrow is as smooth and as simple as possible. Experience our products and services live at CeBIT in Hanover from March 14-18 at the Deutsche Telekom stand C38 in hall 4. Digitization thinkers and leaders discuss their hands-on experiences in top-class talk formats. More information about the program and scheduled speakers is available at transforum.telekom.com. Deutsche Telekom’s entire presence at the trade fair is carbon-neutral: All CO2 emissions generated in setting up and operating the stand are offset fully by carbon-reduction projects abroad. Deutsche Telekom is one of the world’s leading integrated telecommunications companies with more than 156 million mobile customers, 29 million fixed-network lines and around 18 million broadband lines (as of December 31, 2015). The Group provides fixed-network/broadband, mobile communications, Internet and Internet-based television TV products and services for consumers, and ICT solutions for business customers and corporate customers. Deutsche Telekom is present in more than 50 countries and has around 225,200 employees worldwide. The Group generated revenues of 69.2 billion euros in the 2015 financial year – around 64 percent of it outside Germany. As one of the leading global ICT service providers, T-Systems supplies integrated solutions for business customers. These are based on global offerings in fixed-network and mobile communications, highly secure data centers, a unique cloud infrastructure built around standardized platforms and global partnerships, and top security in line with the strictest German data protection regulations, as demanded by our customers. With a footprint in more than 20 countries, 46,000 employees, and external revenue of 7.1 billion euros (2015), T-Systems is the ideal partner for digital transformation. Alongside traditional ICT services, T-Systems‘ portfolio also offers cloud access, custom infrastructure, and platforms and software from the cloud, alongside innovation projects in future business areas such as big data, the Internet of Things, machine-to-machine (M2M) communication, and Industry 4.0.